Audiobooks are rapidly gaining popularity with widely accessible digital downloading and streaming services. 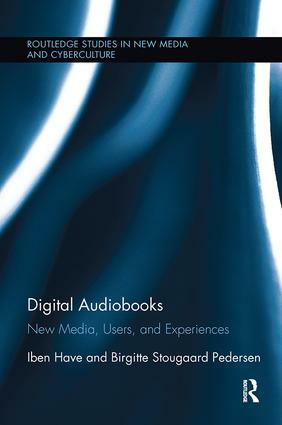 This book engages with the digital form of audiobooks, framing audiobook listening as both a remediation of literature and an everyday activity that creates new reading experiences that can be compared to listening to music or the radio. Have and Stougaard Pedersen challenge the historical notion that audiobook listening is a compensatory activity or a second-rate reading experience, while seeking to establish a dialogue between sound studies and media studies, comparative literature, aesthetics, and sociology. "Have and Pedersen contribute to a much needed rethinking of our concept of reading. As such, their book should be of great value to researchers and teachers within different fields who are interested in understanding mobile media use, literary reception, the multimodality of reading, and the relationship between media technology and user experience." "This book is part of a series dedicated to study new media and cyber culture and Have and Pedersen did a great job delivering valuable information based on a massive research with high standard references, making this book a great contribution to digital media studies. (…) Digital Audiobooks: New Media, Users and Experiences encourage new generations to start seeing the activity of audiobook listening as a first-rate reading experience." Iben Have is Associate Professor in Media Studies at Aarhus University. She works in an interdisciplinary field between sound studies and media studies. She has written the book Lyt til TV (Listening to TV, 2008) and several book chapters and articles concerning sound and music in audiovisual media. Her current research interest is audio media like audiobooks and radio, and she is founding editor of SoundEffects: An Interdisciplinary Journal of Sound and Sound Experience. Birgitte Stougaard Pedersen is Associate Professor in Aesthetics and Culture at Aarhus University. She works in an interdisciplinary field between comparative literature, aesthetics and sound studies. She has published the books Lyd Litteratur og Musik (Sound, Literature and Music, 2008), edited Hiphop in Scandinavia (2008), Offbeat—Pluralizing Rhythm (2013) and several articles concerning literature, mediality, sound, and music. She is founding editor of SoundEffects: An Interdisciplinary Journal of Sound and Sound Experience. This series is our home for innovative research in the field of digital media. It includes monographs and targeted edited collections that provide new insights into this subject as its influence and significance grow into the twenty-first century.